All areas within the dotted white border are for the guests’ exclusive use during their stay. Please click on the different areas of the map for information about the property and surrounding features. If you would like further details, please do not hesitate to contact us. Please select an area by hovering over the map. This image shows the heated swimming pool at La Borie, available for guests' exclusive use during their stay. The pool has private access via a short path from the gites. For full information, please see the Swimming Pool page. The orchard, which gently slopes downwards from the pool area, provides an open space in addition to the larger field. The orchard is directly accessible from the gites' parking area. This image shows the front of the gites, including the outdoor seating areas. Please note that we are currently building another tiled awning for the outdoor seating area on the right of this image, which will be ready for the 2019 season. For full information about the inside of the gites, please see the About Our Accommodation page. 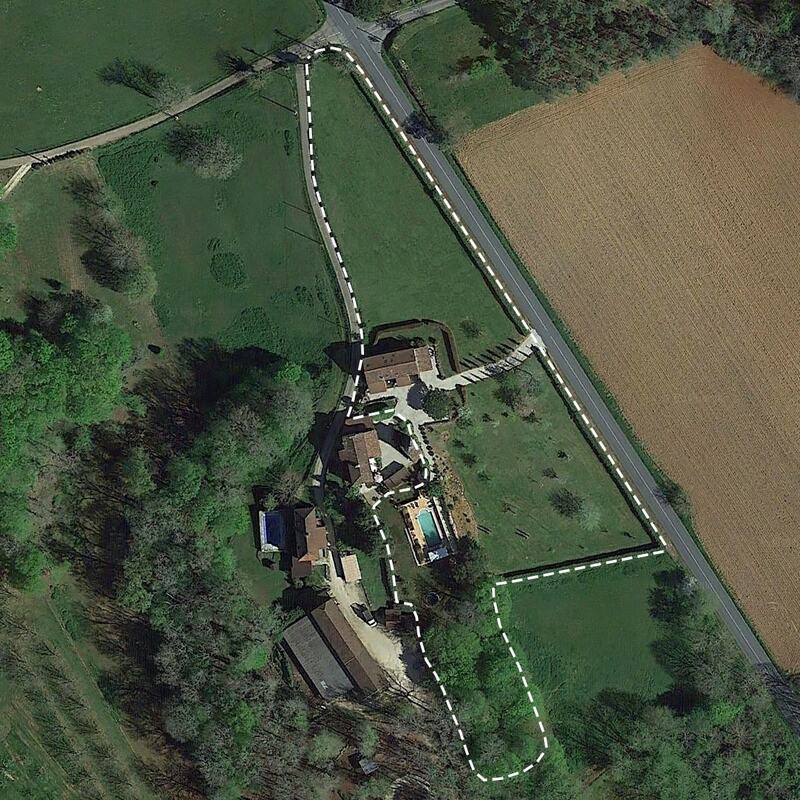 The enclosed grass area is directly accessible from a back door in Gite 2, or via the parking area. There is a table tennis table set up for guests' use, along with additional seating. The large field is also directly accessible from the enclosed area. The parking area comfortably provides spaces for 4 vehicles very close to the gites' front doors. The parking area is overlooked by the old farm's pigeonnier tower. Please note that the driveway is also occasionally used for access to the La Borie farmhouse. The main field at La Borie is located behind the gites next to the enclosed grass area. The field is relatively flat and therefore ideal for playing games. There are also excellent hiking paths accessible from the northern end of the field, of which further information is provided to guests upon arrival. In addition to the large field and orchard, there is another garden area and woodland available for guests' exclusive use. Within this area there is a large trampoline and children's swings. The woodland is an excellent place for children to play if a shady area is preferred. The private farmhouse at La Borie is located outside the guest areas, but guests are very welcome to ask for any information, local advice, or help with anything during their stay. One of the region's best horse riding centres is located adjacent to La Borie. The centre makes use of the excellent local bridleways and quiet countryside, and guests are very welcome to request a booking for instruction and local excursions (available in English). This is particularly good activity for children. The riding centre's website is https://cleirina.jimdo.com/. Alternatively feel free to contact us if you may be interested in making a booking during your stay. The gites at La Borie are set back from the road that leads down the hill to the village of Frayssinet-le-Gélat. The road is completely separated from the property by a large hedge and is not busy, but vehicles do pass by occasionally. The village and its amenities are a very short drive (less than 1 minute) or short walk away. For further information, please see the Village and Local Area page. 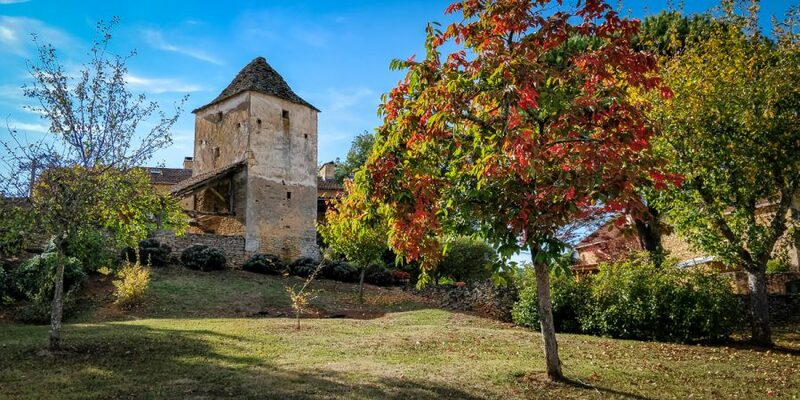 All payments for La Borie Gites are processed by Stripe, a leading secure payment platform.